Ahhh, Valentine’s Day, a day of love, romance and chocolate. I love Valentine’s Day because it’s full of hearts, flowers and sweets, however I think now a days it’s more for the newly in love couples. I remember back when I was dating my now Husband, he would have flowers sent to my work, surprise me with chocolate or jewelry and now it seems like life gets in the way for all that romance. It’s more like, for Valentine’s Day can we get tires for the car? I don’t feel like cooking, let’s get a pizza. Routine tends to take over and we miss out on all the little fun things in life, like V-day. I don’t think it should be like that, but that’s what happens. But those kind of things don’t stop me from treating my Husband with treats like this. Homemade Angel Food Cake. This is one of my favorites, if not my favorite cake. Not because it’s low-calorie, but because it’s so light and fluffy and I just love the taste. 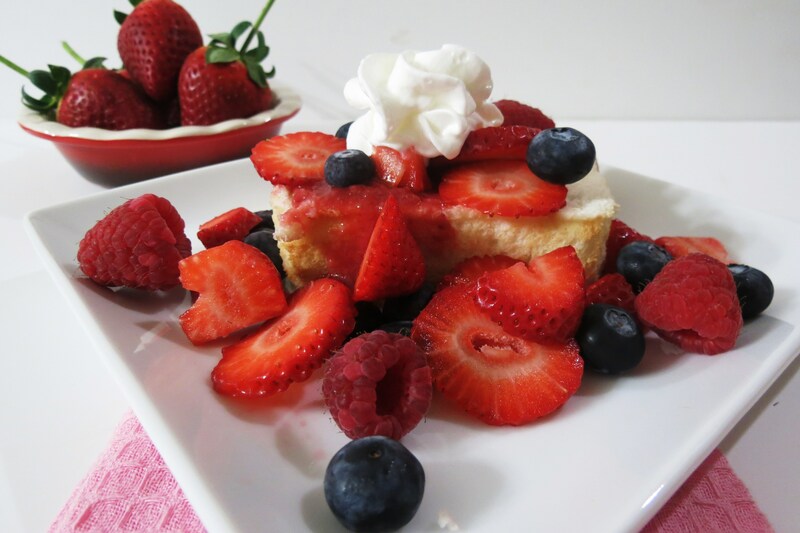 I love adding fresh berries to it, eating it by its self or even drizzling chocolate over the top. 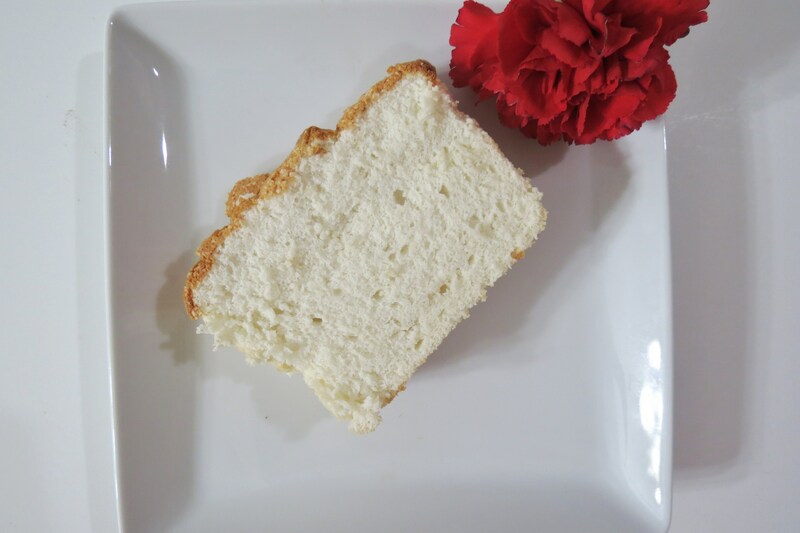 Angel Food Cake is just the best cake, and pretty easy to make! I do not own and angel food cake pan so I baked this in a loaf pan. I am very impressed how well it came out. It’s perfect! Crusty top, soft everywhere else. I swear I could eat the whole cake! Yes the whole cake! But it is Valentine’s Day and of course I will share with my Husband. I’ll let him spoon feed it to me, and maybe just maybe I’ll give him a bite! Ha ha Fat chance! Here’s what it looks like when I took it out of the pan. Kind of plain-looking, so you need to dress this up, and make it pretty! Of course there is nothing wrong with plain Angel Food Cake, but dressed up is so much better!!! There’s no surprise I like my berries! 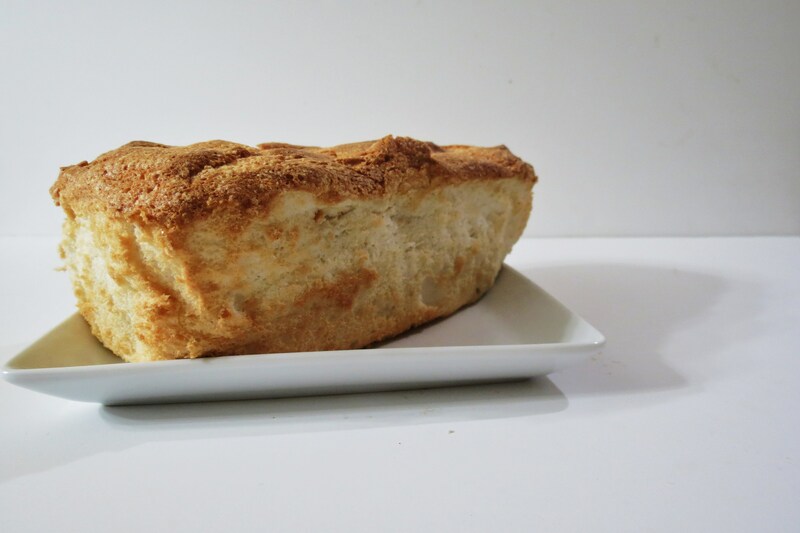 Line a 9×5 inch loaf pan with regular aluminium foil. Mix half of your ground sugar in a small bowl with the cake flour and salt. Set aside. In a large metal bowl, beat the egg whites with an electric mixer until foamy. When foamy, add the cream of tartar and beat until medium peaks form. Slowly beat in the sugar. With a large scraper, fold the flour mixture into egg white mixture, a little bit at a time. Carefully spoon mixture into the ungreased loaf and bake for 35 minutes. Check cake by sticking a toothpick in it, when it comes out clean, cake is done. Let the loaf pan cool, then carefully lift from pan and peel away the foil. 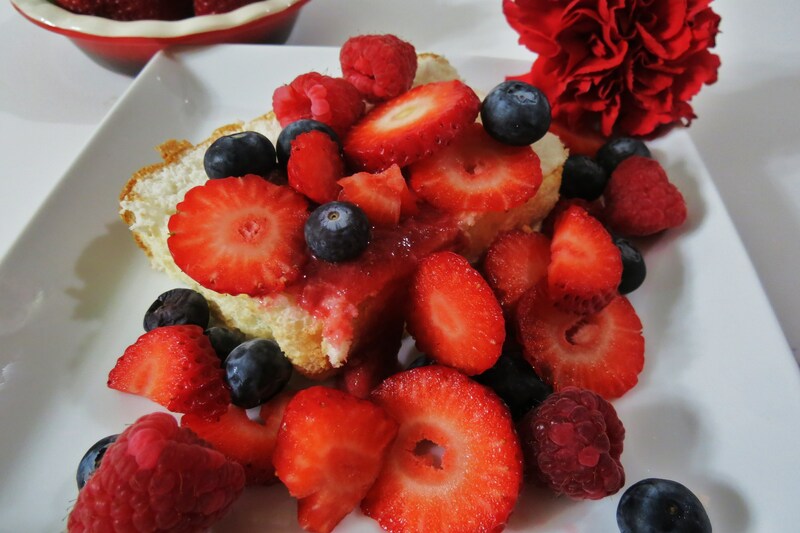 you can’t ever go wrong with angel food cake & berries! yum!! Happy Valentine’s Day! You had me laughing about new tires for the car. Items you receive from your husband sure can be different once you are married, eh?! I am still hoping I receive some chocolate tonight 🙂 Your new site is fabulous by the way–as is this angel cake! Berries make everything better! Happy Valentine’s Day to you. Those berries look SO good! What a perfect dessert for Valentine’s Day! You pile on the berries like I do! I have never made a homemade angel food cake. My mother in law had enough mixes for it on hand to have one every week for months. She had an old glass Coke bottle that was just. for. her. cakes. Fun memories. I’d have to make it in a loaf pan, too, although I wonder when I got rid of my tube pan…..
My Mom used to put it on an old bottle coke too!!! That does bring back memories! Wow – this is stunning! Not only a delicious sweet treat – but your photos are STUNNING! Happy Valentines Day! Angel Food Cake has been on my list of things to try for ages now. Yours looks like it turned out perfectly! Stunning. And I want one now! The first year my other half was courting me, we went all out on Valentine’s day, dining, drink and partying. After that, we gave up for everything has become pricey as the years went by and now, we try to live our marriage by having Valentine’s day in between our busy life like dining, catching up on a movie, having a drink during weekends etc etc. This angel cake you have shared falls right for a home celebration of Valentine’s day, simply love the outcome. 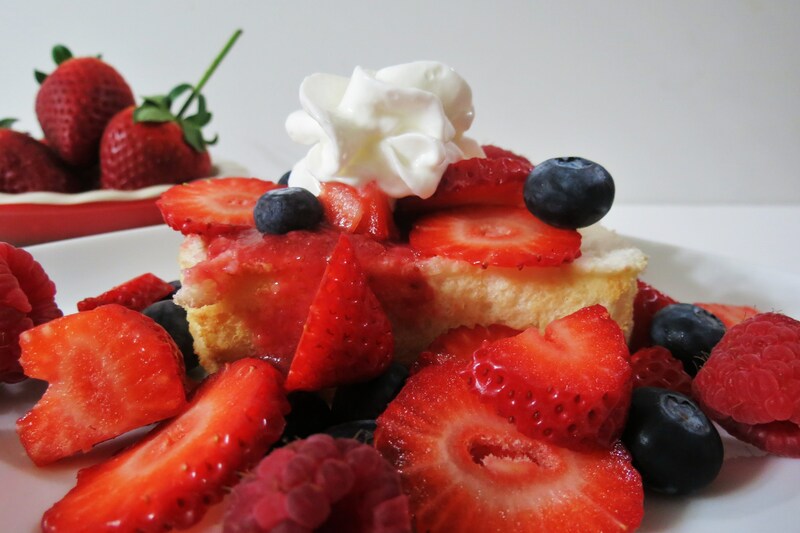 This looks yummy, I love angel food cake but I’ve never made it myself. I think it’s about time I tried! You must try it!! It’s so good and easy!!! If you do try it, let me know what you think!! aw that turned out great in a loaf pan! I love your pictures, your cake looks absolutely gorgeous! (and delicious!) 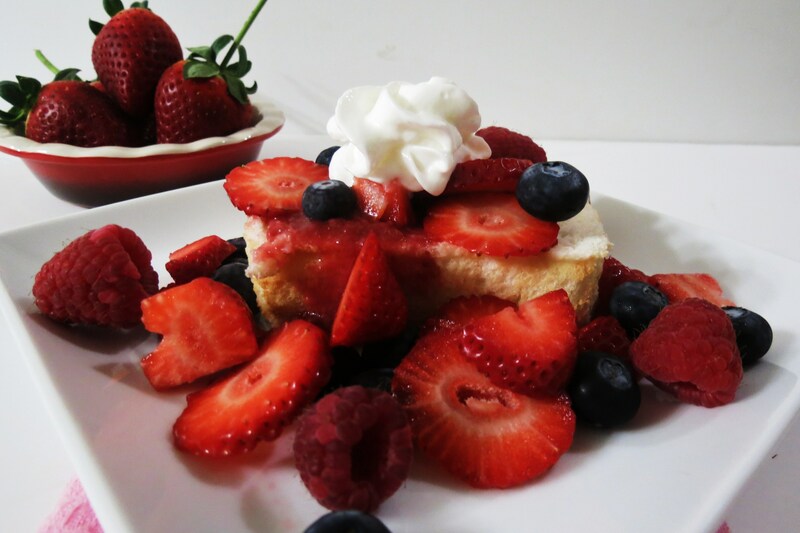 Those berries and whipped cream look irresistible!